When looking to build a new pool, it’s important to be knowledgeable of common pool expressions and features. Filters, pumps, chlorine and pH are a few everyday pool terms that even the most unversed potential pool owner knows. A feature that is often overlooked, but can create a stylish and unique element to any pool is a scupper. The term scupper has a nautical origin meaning, “a hole in a ship’s side to carry water overboard from the deck.” Scuppers in swimming pool design work very much the same way. However, instead of carrying water away from a location, they allow water to flow into the swimming pool while keeping style and design in mind. An inexpensive and easy to operate upgrade that adds luxury and design to any pool, scuppers continue to gain in popularity. Initially simple and practical in nature, scuppers have evolved into a prominent pool upgrade available in a variety of designs and materials, while delivering water in aesthetically pleasing and relaxing ways. 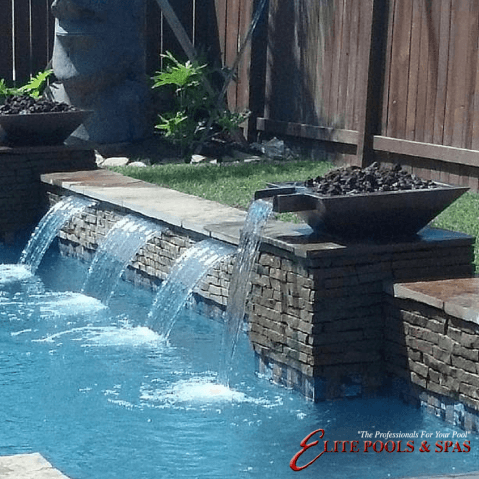 The staff at Elite Pools and Spas will work with you to create a blueprint of your vision, including custom features such as a scupper that will deliver the pool of your dreams in your very own backyard.